During my time at MuleSoft, I had the chance to interview some of my colleagues who had interesting stories to tell about their journey leading up to MuleSoft. Meet Moiz, an IT operations Engineer at MuleSoft who is not only a founder of a non-profit school in Richmond, but also serves as the IT technician for his local mosque. I knew Moiz from Year Up, a professional development organization that empowers young adults to reach their potential through career and education opportunities. As the youngest of six children, Moiz constantly learned from his siblings as well as from his father, who changed his career from being a doctor to a taxi driver in order to provide for his family. Such sacrifices opened Moiz’s eyes to grit, hard work, and perseverance. Moiz loves tech, and that’s no surprise since he grew up in the Bay Area. While his friends enjoyed cars, music, and watching TV, he was taking apart his toys and electronics just to put them back together. Moiz wanted to understand how things worked; he always wondered how his action figure made sounds when he pressed a button on it. He broke many action figures trying to get an answer to this question. This curiosity became the foundation for his career at MuleSoft. There were no courses in his high school on technology or IT, but that didn’t stop Moiz from cultivating his interest. During his sophomore year of high school, he created an online gaming forum that garnered more than 1,000 followers at its peak; but then, unfortunately, got hacked. This incident led Moiz to a new path: the role of security in technology. The above incident and Moiz’s curiosity pushed him to sharpen his technical skills. The internet was his library: he watched YouTube tutorials for various mods and hacks, read articles about the latest technology trends, and more. He grew his skill set quickly––from jailbreaking iPhones to modding/flashing gaming consoles. Moiz then enrolled in college and started working at a startup part-time, but he still felt the need to gain more work experience. That’s when he joined Year Up, which provided him with the ability to grow his skills through coaching and classes. 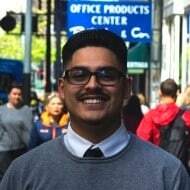 Through MuleSoft’s partnership with Year Up, Moiz stepped foot into the San Francisco office as an intern on the IT Operations team. He fell in love with the culture and the “incredibly amazing, brilliant, and kind-hearted people.” His team was ready to challenge him and help him grow. His managers, Mike Hamilton and Brian Yi, always set him up for success. They never limited Moiz during the internship because they wanted to see what he was capable of. He thrives on pushing himself to go out of his comfort zone. His work ethic and core values aligned perfectly with MuleSoft. It’s clear to anyone that joining MuleSoft is like joining a rocketship, and Moiz was ready for the challenge of working at a hyper-growth company because of his background in establishing a non-profit, volunteering as the IT Technician for his local mosque, and more! Today, Moiz’s impact can be seen within the IT team as well as across the wider company. He now works on the IT information security team, leading a variety of projects––from ensuring all endpoints have a Next-Generation Antivirus sensor with security standards to creating the Snapchat filter for MuleSoft’s IPO in 2017! 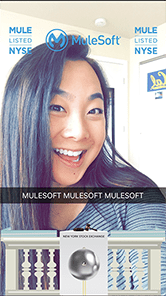 Interested in learning which paths you can take at MuleSoft? Check out our open positions!